It’s a passive-aggressive greatest hit. And it’s the highlight of the series of posts — which gets under way here — I was most eager to write before I heard a minute of the complete tapes. George to Paul: I’ll play, you know, whatever you want me to play, or I won’t play at all if you don’t want to me to play. Whatever it is that will please you… I’ll do it. Having just heard the band make their way through a somewhat torturous rehearsal of “Don’t Let Me Down,” the context is finally here of just why George was ready to snap at Paul. But it’s a long and, well, somewhat direct road to get to “whatever it is that will please you,” and the tension isn’t one-sided as the group pivots to Paul’s “Two of Us,” an ode to his bride-to-be, Linda. In listening to the entirety of the “Two of Us” tapes, Paul’s ready to jump at anyone, feeling quite on the defensive. John, for one, doesn’t take the bait. And in fact, as the session for the song goes on, John actually attempts a bit of a peacemaker role once things begin to boil between Paul and George. But that comes later. George, on the other hand, is quite ready to share his feelings with Paul. Musically, the song isn’t too much different than it had been before they broke for the weekend, on Jan. 3. It’s upbeat, and completely electric at this point. But like the final version, it’s a Paul-John duet. The first take of the day, straight from the top after they had moved on from “Don’t Let Me Down,” breaks down seconds in when John asks if he’s supposed to be singing. Paul: Melody. You’re supposed to remember the words, too. John: Yes, I’ve got them here. John: I almost know ’em. And we’re off and running! Just another 50 or so minutes of remaining rehearsals of “Two of Us” — and arguments — to go. Fasten your seat belts. The tension never lets up — getting to “whatever it is that will please you” was inevitable. 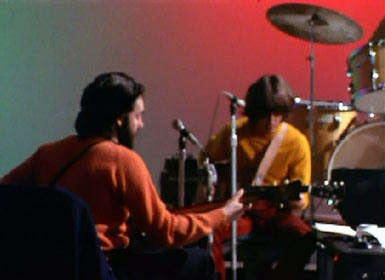 Paul references past Beatles songs a number of times during the rehearsal, beginning with an early run-through, when he dictates to George that the guitar part during the verses should sound “like that bit in ‘Getting Better All the Time'” (meaning the staccato guitar part opening the song and that plays throughout). After subsequent noodling around with the song, Paul tries to restore order and get down to actual business, in the orderly, McCartneyesque manner we’ve come to know and love/hate. This is indeed true through the first few days of the sessions. “Don’t Let Me Down” is dragged down by the bridge. “I’ve Got a Feeling” isn’t quite right yet. “All Things Must Pass” is very much a work in progress. “Maxwell’s Silver Hammer” isn’t finished yet. You get the picture. Only “One After 909” – written more than a decade earlier, despite the slower arrangement, and born in these sessions out of an oldies jam – was in game shape. Another pass at “Two of Us” and things break down as they enter the first bridge (“You and I have memories…”). So it’s time for a band meeting (Ringo, the passive drumming robot, says nothing throughout). Paul: We’re going to have to sort of bring it together, because we’re all at odds. We’re doing that thing we did on The Beatles — we’re all playing, you know? Like in this verse, it’s two harmonies singing, trying to say some words, right? So it’s just… (he vocally apes a guitar vamp ). And in the bits when we need bits…. John: I’m just trying to sing it and do this thing (he plays the guitar part played during the “We’re on our way home” line). Paul: We’ve got to get the riffs when the riffs bits come in. Paul: But it’s not together, so that it’s not sounding together. Paul: Or, we can stop and say it’s not together. George: Yes, then you’ve got to carry on until you get it together. It’s all right to keep playing until it sounds like it’s blending with the rest. Paul: I never know what to say to that, you know? ‘Cause what I want to say is, “Now, come on,” and play, but I can’t, I know. You know, and we get into that one. OK.
They’re not talking about what sounds good, what words work or don’t or the like. This is a debate about the philosophy of how to rehearse. We’re in uncharted territory. These four men are writing a record on the spot, under strict time constraints to get these songs in working order for a show that’s going to happen at some unknown locale, and very soon. You’d think this kind of thing would have been hashed out, but then again, why would it? When they last toured, in 1966, they played about a dozen songs — nothing brand new, and some songs they’d been playing for many years. They knew the songs inside and out, plus they weren’t writing anything special for the tour or struggled under the pressure of the clock. And when they last brought new songs to the table — a few months earlier for the White Album sessions — they didn’t have the pressure of the live show. There’s a bit of nervous laughter from Paul before he continues to offer a logic he repeats numerous times over the “Two of Us” sessions this day. Paul: … It’s complicated now. See, if we can get it simpler, and then complicate it where it needs complications, but it’s complicated in the bit. Paul: But, I mean, you know. While George is low-key throughout, speaking in completely passive-aggressive tones, Paul grows audibly exasperated. George: No, you’re not annoying. It’s not annoying anymore (or is it “anyone”? Hard to tell). Paul: … And I get so where I can’t say it. But you know what I mean. Just do this then, and, I don’t know. I can’t do it on film either. I don’t know if we can do it on camera. Funny, Paul had just said earlier in the day that he didn’t mind being filmed, that the band has ignored the camera from the moment they started filming at Twickenham a few days earlier. But as it would turn out, Paul would end up having to continue this discussion on camera after all, and it would become one of the iconic moments of the Get Back/Let it Be sessions and the film — behind only the rooftop concert — and truly in the group’s history overall. The in-depth look at the “Two of Us” sessions on Jan. 6, 1969, will resume in the next post. Coming very soon! George’s playing does seem relatively unfocused circa Twickenham. Lots of wah-wah noodling. Once they get to Savile Row the sounds start coming together, as it were. P.S. I’ve long thought that Two Of Us was as much an ode to John as to Linda. And it’s hard not to think of John when listening to the song, and especially to see them sing together. Who else would he chase paper with? !